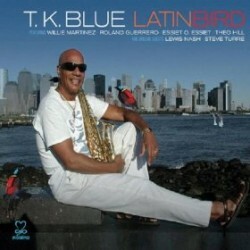 Saxophonist TK Blue’s new CD is Latinbird (Motema Music, 2011). In this interview, Blue talks about his decision to record an album of Parker’s music; his years in Paris and his early days in New York; and how his relationships with Randy Weston, Abdullah Ibrahim and Benny Powell have shaped his life and music. Learn more at www.tkblue.com. Tracks used in this episode: Chi Chi; Si Si; He Flew Away too Soon; Visa; Bluebird; Barbados; Steeplechase; Buzzy. Great saxophonist, I appreciate this music, he has a precise and clear sound …, and I think the pianist also play with swing. I agree people nowadays don’t have attention for solos with 20 minutes.